The adult beetle emerges from its underground wintering in June or July. In July, the female beetle burrows about three inches into the ground and begins to lay eggs primarily on well-watered turf in full sun, often near pavement. In about two weeks, the eggs begin hatch and feed on roots of grass and other plants. During this time, the grub will molt two to three times until October. Grubs will then burrow down into the ground up to eight inches over winter. In late spring they stop eating, enter the pupa stage and emerge as an adult in early summer. 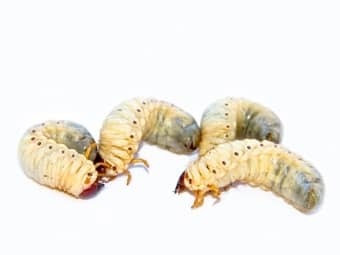 The true white grub (May or June beetle) typically has a 3-year cycle, meaning it could potentially damage turf throughout the season. Damage from grubs typically starts in mid-August and may continue until early October. Affected grass appears as patches of dead or dying grass and is brown and wilted, looks burned, and rolls easily away from the soil. If you notice skunks and raccoons tearing up the turf, that is an indicator that they are in search of grubs. Perhaps the worst thing about lawn damage from grubs is that the grass rarely recovers. You'll just have to live with patchy grass for the season while you get the grubs under control. Overseed your lawn every spring and fall. The thicker the grass is, the less likely it is that lawn grub eggs will be present. Spray beetles at first sight with insecticide. Apply granular insecticide to lawns in summer. Pick up dead plant material from gardens. Very young grubs eat decaying plant material.